Games or software related to the MS-DOS platform. ChampGames / Champrogramming / Champ programming was a game developer from the US founded by John W. Champeau. Robert Cole was in charge of sound design. They produced quite a few wonderful ports of classic arcade games around 1996/1997 running on MS-DOS & Windows95 PCs. Boulderdash by First Star Software originated on the Atari-8-bit computer line, hopped over to the C64 and was actually released on a whole myriad of other platforms including the old IBM-PC. It came on 5.25" floppy disks and it is a selfbooting disk - with a modified version of MS-DOS on it that directly boots into the game. Check out the game and see how I play until the first game over. Zaxxon, I believe this is one of the first isometric arcade games out there. It was developed and published by Sega in 1982 and one could call it a so called 'isometric shoot'm up'. Many ports were created on various platforms like: Apple II, Atari 8bit home computers, MS-DOS (CGA), Atari 2600, MSX, Commodore 64, Dragon32, Colecovision, Intellivision, Sega SG-1000, TRS 80 Coco. The 2600 and Intellivision versions didn't use the isometric viewpoint and are much unlike the others. The Amstrad CPC, BBC micro computer and Ti/99 reveived well done but unliscensed ports. Lure of the Tempress: Screenshot from the first part of Lure of the Temptress, dialogue screen. Lure of the Temptress was the debut of a new British GAG developer called Revolution Software. The game appeared in 1992, the same year Lucas Arts released its classic Indiana Jones and the Fate of Atlantis, and two years after The Secret of Monkey Island and Loom. Around the same time, Sierra was releasing the fifth installment of King's Quest. In short, Lure was part of what we might call the early "Golden Age" of GAGs, when a few major companies were putting out very innovative work--but when a smaller company like Revolution (or Cyberdreams with their Darkseed game) was still able to make their presence felt with an innovative title. Lure was (and remains) a popular title for the Amiga platform, and even the DOS version I played had an Amiga-like quality to the graphics. 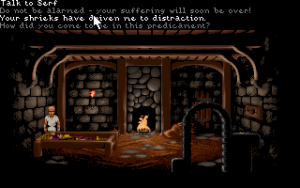 Simon the Sorcerer is one of those games that has been on my backlist for quite some time.